MacBooks to slim down even more? 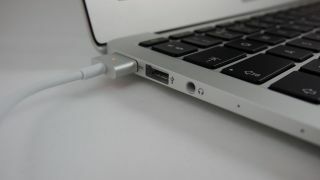 A new patent application shows that Apple is planning to introduce a new hybrid USB and SD port. Combined ports could mean less space is needed on a new machine, making an even slimmer design possible. Titled "combined input port", the port design has offset pins inside that could work with "different types of connectors, memory cards, or plugs", the application says. Fewer ports also means that fewer physical devices can be connected at once. However, that may not be a problem with the increased reliance on wireless connections, while the growth in cloud services means there's less need for portable USB storage devices. This isn't the first Apple MacBook patent to hit the airwaves today. Earlier TechRadar reported that a patent had been filed for a dual-sided trackpad.